You've probably already figured out how the Queen moves if you've been going through this series. If not, now that we're done with the Rook moves, it's time to deal with the Queen. Her powers are a combination of two other pieces. The Queen is the strongest piece in the chess army. She must be protected in the early stages of the game. It is generally not a good idea to bring the Queen beyond the third or even second rank during the opening. First let's just see where the Queen sets up at the start of the game. There is an old saying to remember, Queen on her color. After the pawns, the minor pieces and the Rooks have been placed on the board there are two home rank spots remaining. One for the Queen and one for the King. But which is which? The easiest way to remember is to keep in mind the old maxim Queen on her color. That means that the White Queen always starts on d1 which is a light square. The Black Queen always begins the game on d8 which is a dark square. Remember the corner square nearest to your right hand must be a light square. This square is h1 if you're playing with White, a8 if you're playing with Black. Okay let's see how the Queen moves. As I said earlier, the Queen enjoys a combination of the power of two other chess pieces. Those two pieces are the Rook and the Bishop. This means she has unlimited freedom of movement along diagonals, ranks and files. 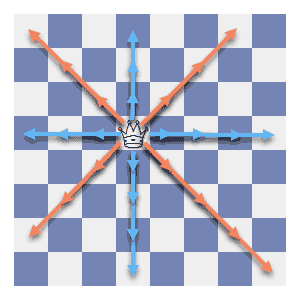 This ability to move diagonally and orthogonally (straight) excepting blockades gives the Queen unrivalled mobility. She cannot however move like the Knight. That would have made her even more deadly! Even so when positioned in one of the four center squares where she has maximum mobility, she actually controls nearly half the board! This is phenomenal power. Queen Moves: This position could not arise in a real chess game as both Kings are in check at the same time. The purpose of the diagram is really to show two unrelated positions. The White pieces show a Knight supporting the White Queen's attack on the Black King. The Black pieces show a Bishop supporting a similar attack on the other side. A common theme in chess is the cohesion and interaction of a number of pieces working together against the enemy. This often involves a Queen and a minor piece. Queens work well with Bishops. One of the reasons for this is that a Bishop is a long range piece and can support attacks from any distance. This can be up close or the other side of the board. Capablanca once observed that even though a Bishop is often stronger than a Knight, a Queen and Knight trumps a Queen and Bishop. His reasons for holding this opinion was that the Bishop's move could only mimic the Queen. But because of the Knight's unique move, he can reach squares that the Queen could not giving this pair an added dimension. It's easy to sum up the Queen's move then. She has the Bishop's move and the Rook's move. But not the Knight's move. She can get around the board like lightning. This makes it possible for a Queen to take on attacking and defending duties at the same time. Play through the Queen tutorial. Remember not to advance the Queen in the opening. There are too many dangers lurking early in the game. Wait for things to open up first. Introduce the Queen to the fight at the right moment. One day your handling of this piece may be so great that you will perform a Queen sacrifice. Just one piece left to discuss then. Certainly not the most mobile, but for all of that the most important none the less. This piece is the one that the entire game centers around. You must capture this piece to win and you dare not lose your own. He is of course the King.